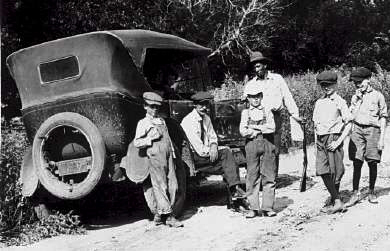 Goodland's streets were simply dirt paths until 1921, when the City of Goodland hired Cook & Ransom, an Ottawa, Kansas, firm, for the sum of $109,703.60. Cook & Ransom advertised their Native American bricklayer "Speed King" Jim Brown. Brown is the man standing by the car in the picture below. 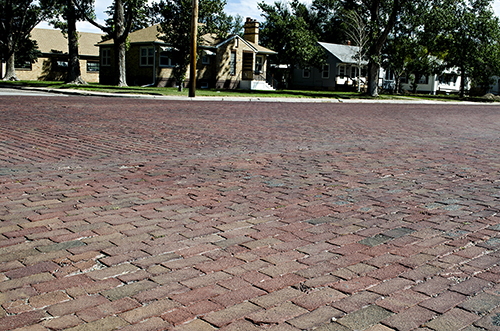 Main Street was to be 65 feet wide and paved with brick from Eighth to 17th. Side streets (10th, 11th, 12th, and 13th) were to be paved for one block each side of Main Street. Street base was five inches of concrete covered with sand. Work started June 7, 1921. Brown was in Liberal in Southwest Kansas just before coming to Goodland. Kansas' road network was so poor in those days that travel from Liberal to Goodland was fastest if the traveler passed through Topeka in the northeast part of the state. Once base was laid, Brown started laying bricks. He laid 125 to 150 bricks per minute, 36,000 bricks a day. Six men were constantly bringing bricks to him using an instrument similar to ice tongs. The tongs carried a stack of nine pound bricks. His bricklaying became a spectator sport. The project lasted until December. Seizing a fundraising opportunity, the ladies of St. Paul's Episcopal Church sold doughnuts to the watching crowds. Later Cook & Ransom donated a freight car load of bricks for the church to use. Church was built in 1925 at 121 W. 13th for $17,000. Frank Hoffman challenged Brown to a bricklaying contest in Olathe, Kansas, on September 12, 1925. Brown laid 200 tons of bricks, 46,664 bricks, 1,755 more than Hoffman. He received a "Middle Western Champion" medal, but he claimed to be the "World's Champion Bricklayer". Although his claim was challenged, he was never defeated. In 1925 or '26, Ninth and 10th Streets were paved, Ninth five blocks to Montana Avenue and 10th four blocks to Kansas Avenue. 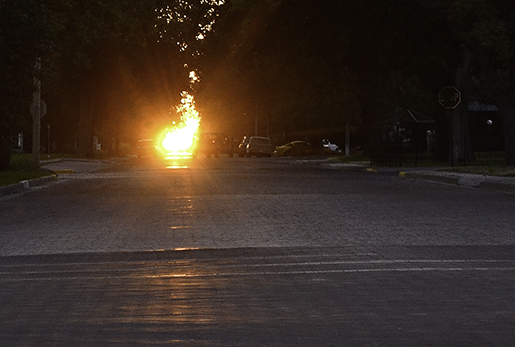 Local lore differs about who had the pull to get their streets paved so far out. Some Goodland citizens complained about the quality of the bricks, their placing and that the overall work was unsatisfactory. Unsatisfactory? Not hardly. Although the many of the bricks on Main Street have been replaced since 2011, some of those bricks are still in place, especially on side streets. Now the bricks are considered to be a Goodland treasure. The local car club is named the Brick Top Cruisers. Their annual car show, held during Flatlander Fall Festival on the south end of Main Street, is called "Weekend on the Bricks". 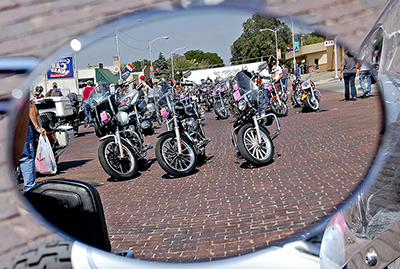 The Northwest Kansas Bike Show takes up the north end of Main Street on Flatlander Weekend, while a street festival is held in the middle. A restaurant on Main Street is called On the Bricks Cafe and the mural on its south wall is titled Bygone Days on the Bricks. The restaurant's sidewalks were constructed from Jim Brown's bricks. Streets were named No. 6 in 2008's Eight Wonders of Sherman County contest.